When deciding what to cook, you should consider the meal as a whole: if, for example, you’ve had a salmon mousse to start, and creamy cheese pasta bake for your main course, you need to find different textures and flavours to zing the palate. A citrus salad served in a crispy ginger basket would allow a complete change of mouth experience and give the diner a sense of novelty and excitement after two smooth and pastel courses. So the first step to a perfect dessert is deciding what you need to do to complement and complete the meal as a whole. Many dessert recipes are simple to scale down to two, or even one portion, and this can be the best way to try out a new pudding that you’re not sure about, as people tend to have much stronger likes and dislikes about puddings than the do about savoury dishes. 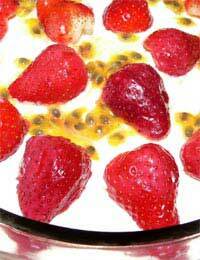 Simply take your dessert recipe and divide the ingredient quantities in half or quarters. This is important because smaller quantities are easier to make and faster to cook. Remember that recipes like cheesecake can be made in individual dishes and served like that, rather than using a springform pan, and cakes can be made in cake or muffin tins and served individually. Dessert ingredients are often complex and exotic – three to five ingredients can make a perfect dessert: eggs, flour, sugar, liquid and flavouring is all you need for a cake or sponge, for example, so when assessing a recipe, look at the length and complexity of the ingredient list and consider how much time and money you’re prepared to invest in dessert! If you’re not a confident cook, you can always assemble a dessert rather than making one from scratch. As an example, buy a good sponge cake, some high quality fruit like bananas, passion fruit and mango and some whipping cream. Cut the sponge into squares and put in the bottom of a dish. Cut the fruit into chunks and flavour with a little sugar and rum and pour over the sponge, then whip the cream and spread over the top – instant tropical trifle with almost no effort! If you do want to make a really impressive dessert for a dinner party, for example, pick something that can be prepared in advance. The alcohol sorbet has a long and sometimes notorious history – Nero is said to have served a wine and honey sorbet at his banquets, after transporting snow from the Italian hills to make the dish. Sorbet is a dinner party favourite because it clears the palate. Put the 200 ml each of sugar and water in a heavy bottomed saucepan and heat gently until sugar dissolves. Cool. Put this sugar water in a shallow container that is freezable and pour in the champagne slowly so it doesn’t foam over. Freeze for one to two hours until just firm. Beat the egg whites until firm and add the 100 g sugar, beating until it is dissolved and the mixture forms a soft peak. Take the champagne mix from the freezer and break it up with a fork before mixing in the egg and sugar mixture with a spatula. Return to the freezer. Every hour, stir the mixture with a fork to stop it setting to firmly. Serve over fresh fruit.